How To Play Keno Online - Casino Answers! 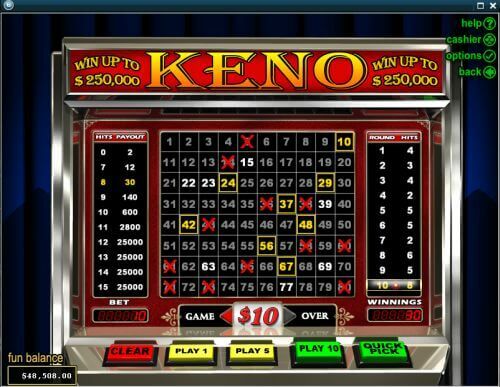 To me, one of the most interesting online games is the game of Keno. 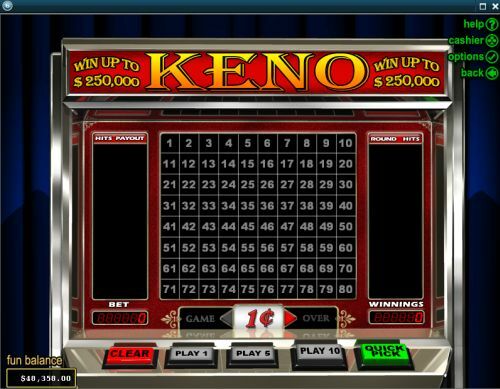 See – Keno is a very basic game. If you’ve ever played it, you know that already. And for years and years I’d see online casinos trying different ways to make it interesting – but no casino could get past “changing the graphics”. I mean there was a TV show style of Keno and things like that – but at the end of the day it was plain and simple Keno. As you can see, it’s very basic and easy to play. So you can see there – the numbers that came up on round 10 are all highlighted. I got 8 numbers for a 30 credit payout so it’s listed in the winnings. And on the right side I played 10 rounds, so it lists all 10 and the amount of hits I got and there’s a special icon for where I won. One other neat feature is say you like to keep track of the numbers – simply hover your mouse over “Round 7” for example and it will show you the 2 numbers that came up for you on that one, and all the numbers that actually came up. And that’s how you play Keno online. There are some neat variations of Keno, but for a nice beginner version you can play for free, head to Bovada. I heard about Multi Card Keno. What is That and How Do You Play That Online? I refer you to my friends over at MultiCardKeno.com for all the answers about Multi Card Keno.